WATCH: Boy Upstages Pope's Speech : The Two-Way The youngster runs up onstage and clings to Pope Francis during a speech by the pontiff at St. Peter's Square. Protocol is a concept that's often lost on young children, and this boy — one of a group of children invited to sit near the pontiff during a speech — didn't see any reason why he shouldn't hang out for a bit with the guy in white. In this photo provided by the Vatican newspaper L'Osservatore Romano, Pope Francis reads his message as a young boy plays in front of him on the stage. 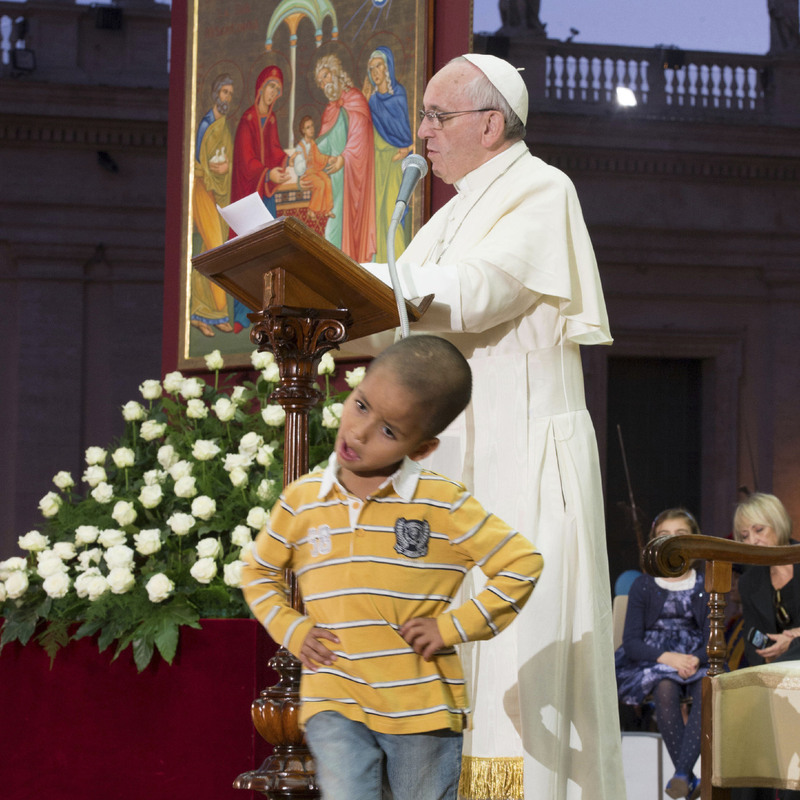 Dressed in jeans, sneakers and a polo shirt, the unidentified youngster crawled up onstage and stood next to Pope Francis during a service at St. Peter's Square at the Vatican over the weekend. The Telegraph says the boy "refused to leave the Pope's side, clinging to his legs while two Cardinals tried to encourage him to sit back down with sweets."